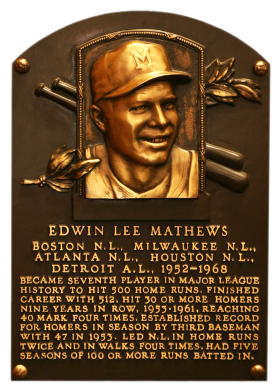 Eddie Mathews combined with Hank Aaron to form one of the best power combos ever. 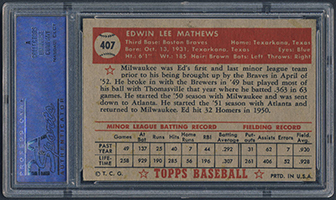 For 14 consecutive years, Mathews hit 23 or more home runs, hitting 40 or more four times. A steady defensive player, he was an All-Star nine times. He led the NL in base on balls in four seasons to retire with a total of 1,444. He also tallied 512 career homers, 1,453 RBI, and 1,509 runs scored. 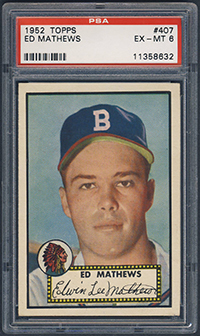 Comments: My first portrait of Eddie Mathews was a 1967 Topps PSA 8 purchased way back in December, 1998 from Outfield Sports Cards. 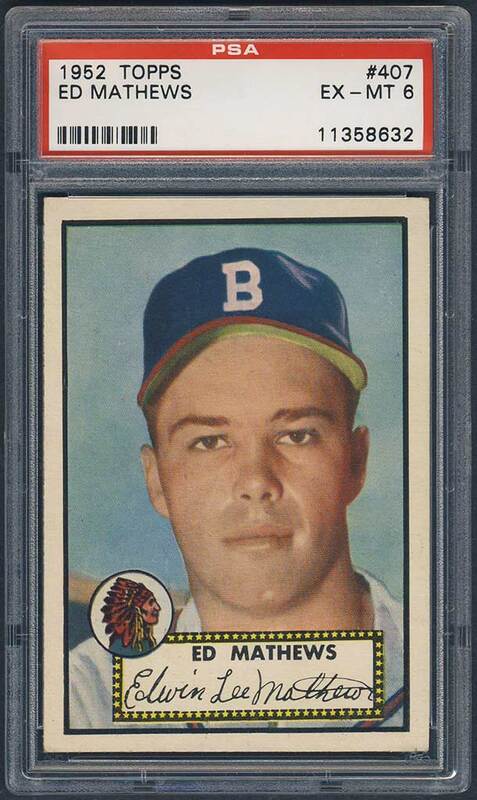 I purchased a 1952 Topps PSA 6 in May, 2006 on eBay from Green Country Sports. The card was slightly OC left to right. UPDATE: On May 8, 2016....story to come! 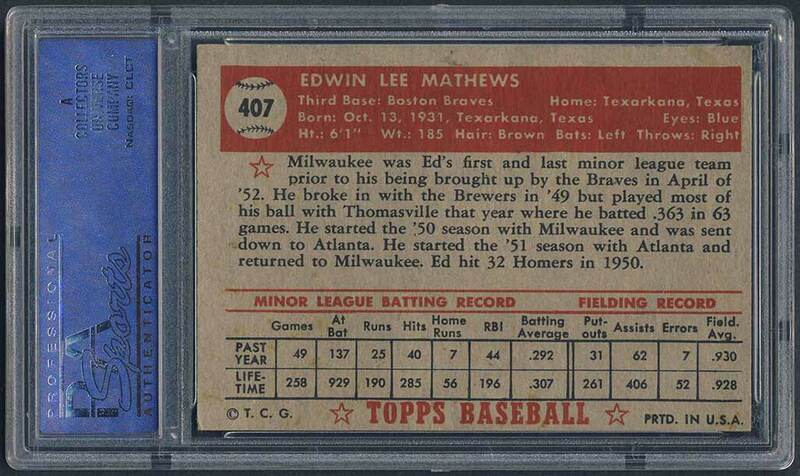 Description: At 407 cards, the 1952 Topps set was the largest set of its day, both in number of cards and physical dimensions of the cards. 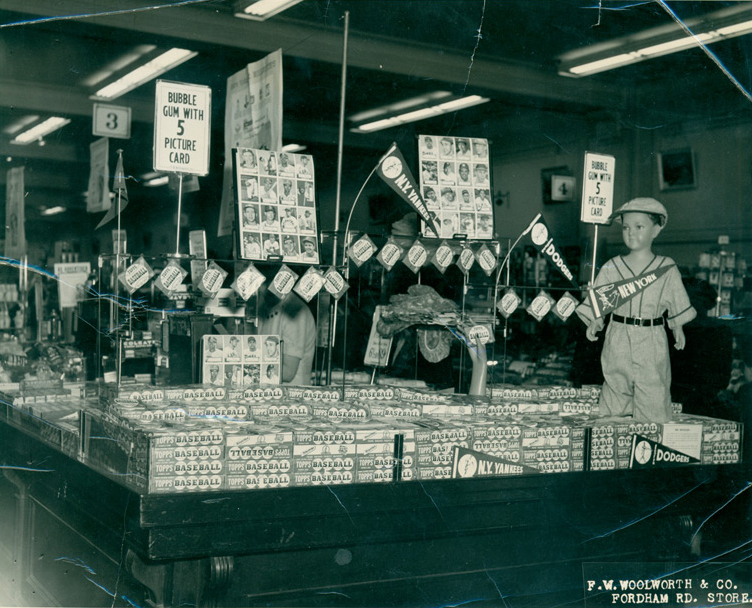 Cards are 2-5/8" X 3-3/4" with a hand-colored black and white photo on front. 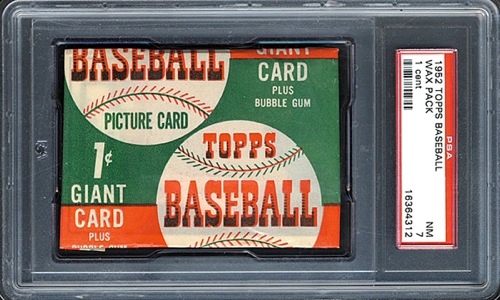 Major baseball card innovations presented in the set include the first-ever use of color team logos as part of the design, and the inclusion of stats for the previous season and overall career on the backs. A major variety in the set is that the first 80 cards can be found with backs printed entirely in black or black and red. Backs entirely in black command a premium. 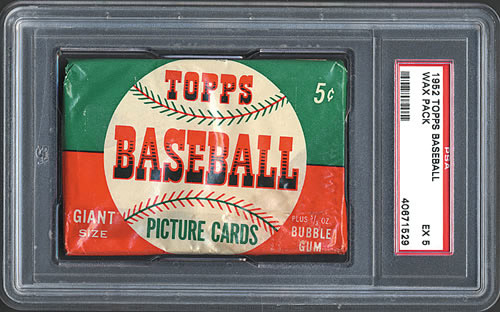 Cards #311-407 were distributed in limited supplies and are extremely rare.